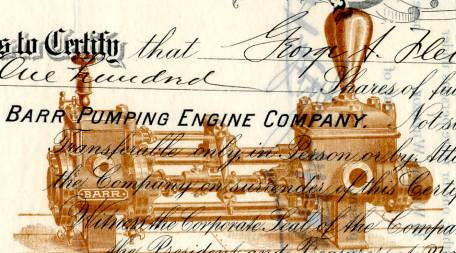 Beautiful certificate from the Barr Pumping Engine Company printed in 1889. 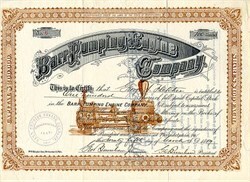 This historic document was printed by the Murphy's Sons Company and has an ornate border and header with an underprint of the Barr Pumping Engine. This item has the signatures of the Company’s President, and Treasurer, George Buruham and is over 122 years old. Although only established four years the Barr Pumping Engine Company, which has extensive works on the Pennsylvania Railroad, near Germantown Junction, is one of the most prosperous and rapidly developing concerns in the city of Philadelphia. The company was organized in 1887, with a capital stock of $2oo,ooo, which is preliminary to a larger capital as the business develops. The officers arc: Samuel R. Marshall, President; William M. Barr, Vice-President and Manager; George Buruham, Jr., Treasurer; Samuel R. Marshall, Jr., Secretary; and Directors: John Pitcairn, George E. Fletcher, George Burnham, Howard W. Middleton, Frank R. Tobey and John Fullerton. The company is engaged in the manufacture of hydraulic engines and machines, and pumping machinery of all kinds. pump will fit any other pump of the same size made by them. The parts which are subject to wear, such as piston rods, plungers, plunger rings, valves and valve seats, are the parts most frequently needing renewal. By a system of manufacture in which all these several parts are made exactly alike, duplicates can be forwarded in advance of shutting down for repairs which need only the renewal of worn-out parts, so that what would require several days can be accomplished in a few minutes. More attention is given to the manufacture of duplex pumping machinery than that of any other type. Pumping machinery from small boiler feed pumps to water works pumping engines of three millions of gallons daily capacity are constantly in the course of manufacture, so that any ordinary size of pump can bc shipped by them within a few days after the receipt of an order. History from StockResearch.pro (Professional Old Stock Certificate Research Service) and WWI Liberty Bonds Buyer.